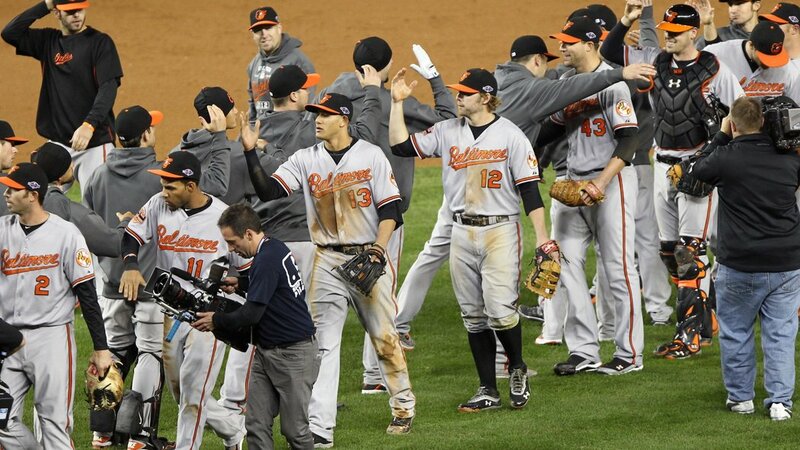 Some have wondered in recent days why I’m so passionate about the Baltimore Orioles. It’s hard to explain without sounding like the pseudo-baseball philosopher George Will. And it’s complex — swirling emotions always are. It transcends simply “being from Baltimore” and to sort it all out would take more than a simple blog post. But I thought I’d share an essay I first wrote for the Baltimore Sun over a decade ago, a version of which (below) ended up in my book What Size Are God’s Shoes: Kids, Chaos, and the Spiritual Life. In it, I share the story of how I acquired the stadium seat from the old Memorial Stadium that now sits on our screened-in porch. The attachment I have for my beloved Birds may remain a mystery, especially to those who eschew sports, but I think anyone can relate to the emotions themselves. I guess I’ve been in a reflective mood after some intense, extra inning games against the hated Yankees this week. After today’s deciding game in the American League Division Series, only one team will continue their season. You know where my heart will be. 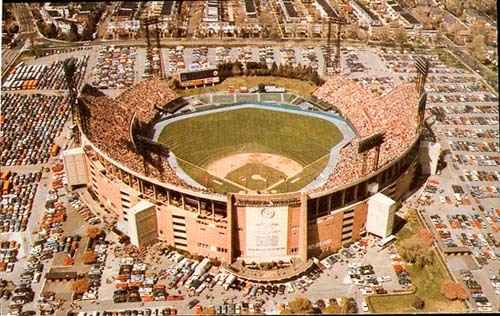 I can’t fully explain why, but I was mystically drawn to the old Memorial Stadium in Baltimore several years ago. The pilgrimage was spurred by the announcement of the structure’s imminent destruction at the hands of a wrecking ball. Yes, the stadium had become the latest victim of the building craze in the arena of professional sports that has turned many old stadiums into dinosaurs before their time. Memorial Stadium, the one-time home of the Orioles and Colts had sat vacant for a number of years, falling into disrepair and becoming a mere shell of its former glory. And yet I was drawn back to this place, a place where I spent much of my youth dreaming, rejoicing, despairing, cheering, and jeering. When the sale of stadium artifacts was announced, an indefinable force propelled me back to 33rd Street. A variation on the mantra from the Kevin Costner baseball movie Field of Dreams came to mind: ‘If you raze it, they will come.’ As I stood in line with my fellow pilgrims waiting to get onto the field, I couldn’t help but feel that I was entering a space no less sacred than a European cathedral ruin. If you’ve ever experienced this you know that even though the stained glass windows are long gone, weeds shoot up through the remains of the stone floor, and bats glide boldly through what’s left of the vaulted ceiling, there is still a pervasive sense of being on holy ground. The generations of prayers that emanated from the site still hover like a cloud of witnesses. You can almost hear the voices of the choir lifted to God in praise and glory. So it was as I walked for the first time onto that glorious field of dreams that was Memorial Stadium. Despite the fact that weeds had overtaken the outfield, the windows of the press box were smashed, and the concrete dugouts were crumbling, I was very much walking on holy ground. In my mind’s eye I could see the stadium packed with a cheering throng. The life, energy, and electricity that once pulsed through the place was much more than a distant memory. The hope and excitement of a little boy once again coursed through my veins and I felt as if my adult self had just been introduced to the childhood version. But I came to the stadium not just in search of memories but as a sojourner seeking a holy relic. Items from the stadium were being sold and I wanted, even needed, one. I had my heart set on a stadium seat, the kind I used to sit in as a boy, a teenager, and a young adult. I sought a tangible piece of this place that I could take home and cherish forever. For Memorial Stadium was more than simply a place where I learned to love the liturgy and ritual of baseball. It was a place of relationships, memories, and magic. Even more important than my sporting reminisces, are the memories of time spent with my father. He took me to my first baseball game in 1975, shortly after my family moved to Baltimore. He had absolutely no interest in the game; he was a symphony orchestra conductor after all, but didn’t want to limit my interests because of his own. As it turned out, I fell in love with the stadium and the game of baseball at first sight. And over the years he actually became quite an Orioles fan himself. When he was dying of cancer he wrote me and my brother a letter while he watched the last Orioles game ever played at Memorial Stadium. In it he wrote about his love for us and the sense of peace he felt as he prepared to take leave of this world. He died several months after the final out was recorded and I’ve always associated the death of Memorial Stadium with the death of my father. Its final destruction was like one last shovel-full of dirt being thrown over my earthly relationship with him. I mourn the loss of the stadium, as I do the loss of my father, but I also take comfort in having known them both. During the Orioles’ American League pennant winning season of 1979, the string of improbable, come-from-behind, last minute victories led to the coining of the slogan “Miracle on 33rd Street.” I think the real miracle is that so many people were brought together through the steel, concrete, and brick that made up Memorial Stadium. My soul was touched and my family, like so many countless others, was nurtured through a public, “secular” structure. 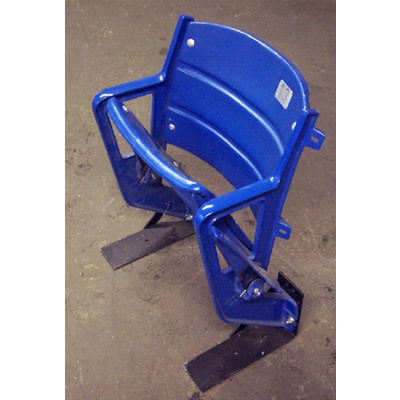 Well, I now have my stadium seat. To my wife Bryna’s chagrin it sits in our family room, though she did manage to keep it out of the living room. I’m not entirely sure what drove me to seek out a piece of the stadium. But I do know that it’s comforting to have in the house. If a religious icon is a window into the mystery of the divine, my new chair is a kind of icon. It serves as a window into a special time in my life and it somehow puts me in touch with a part of my heart that I will always cherish. 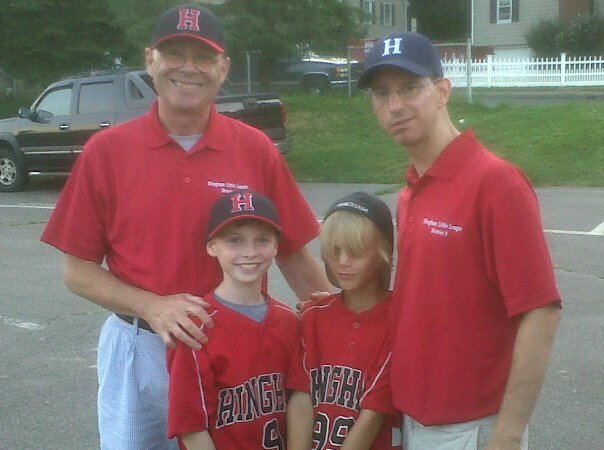 In my latest “In Good Faith” column for the Hingham Journal I reminisce about the good old days of little league baseball. The days before pitch counts and teams being sponsored by nail salons. A time when only football helmets had masks and chin straps and the on-deck circle wasn’t taboo. See, I can be a cranky old man with the best of them. While the game basically looks the same as it did when I was a kid, there are a few notable differences. These differences might seem minor but they say a lot about how society has changed over the years. Yes, many of the changes revolve around safety and fairness – not bad things to be sure – but at least some of the fun has been sucked out of the experience in the process. So if you’ll excuse me I’ll go into my cranky old man mode and wax nostalgic about the way things used to be. Fortunately this attitude never appears in churches. First of all, we used to have on-deck circles. This was the designated area where the next batter in the lineup would swing a few bats to get loose or maybe put on a donut. When kids today think of donuts they can only imagine the word Dunkin’ before it. They have no idea that in baseball a donut is a circular metal weight, generally covered in rubber that is slipped over the handle of a bat to make it heavier in the on-deck circle. The idea is that if you take a few swings with a heavier bat, by the time you take it off and get up to the plate your bat will feel much lighter. Hitting is about bat speed and this is both a physical and psychological tool that today’s little leaguers will never experience. Why no on-deck circle? Why, safety of course. In fact, if the umpire catches anyone besides the batter with a bat in hand it is an automatic out. Which means coaches spend much of their time telling kids to “Step away from the bat.” Elementary-school aged boys seem especially drawn to potential implements of destruction. The other major shift is the emphasis on pitch counts. Now in fairness this transcends little league as even professional managers and pitching coaches now obsess over the number of pitches thrown by each pitcher. Back when we were kids you pitched until a) your arm fell off or b) you starting walking a lot of hitters. Much of the limited strategy employed by little league coaches surrounds monitoring the pitch counts. 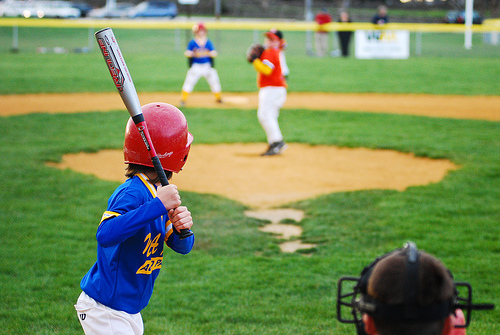 For each age there are rules governing the maximum number of pitches allowed. 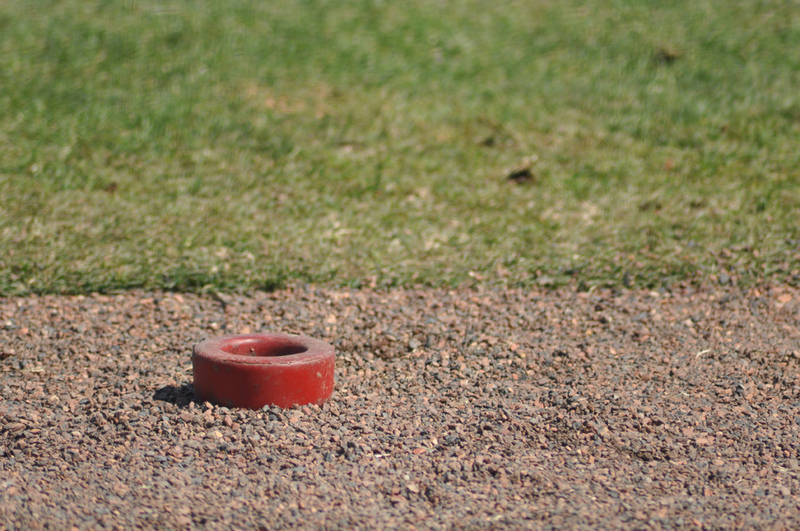 To further complicate things guidelines are in place that translate pitch counts into subsequent days off until that player is allowed to pitch again. For instance a ten-year-old is allowed to throw up to 75 pitches in a game. However if said pitcher throws over 66 pitches he or she cannot pitch for four calendar days; 51-65 pitches translates to three days rest; and it goes down from there. Got it? I suggest that each team be issued an MIT-trained pitch count analyst at the start of the season. Players also now rotate positions at the same rate that you’d trade partners at a hoedown. Everyone is given a chance to play every position. In my day, if you couldn’t catch the ball they sent you out to pick daisies in right field. Today if you can’t catch they’ll make you the first baseman for a few innings. Perhaps this is why the games seem to take longer. 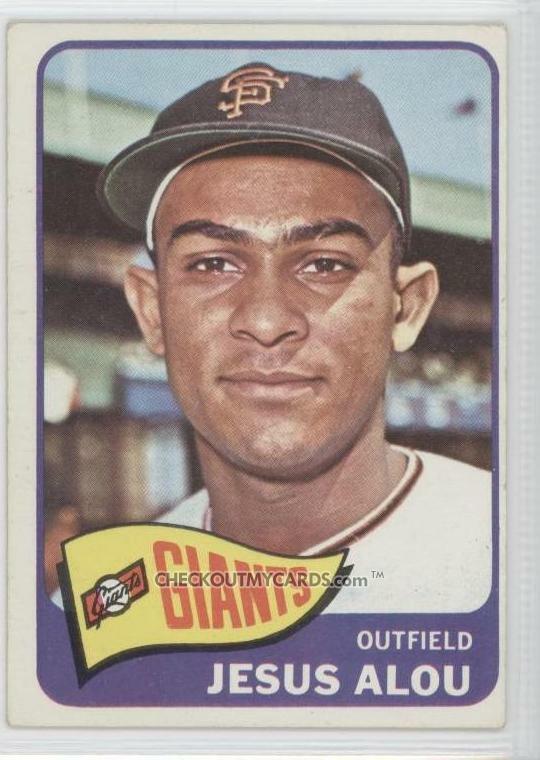 When I was a kid I was a shortstop – that was my position and that’s what I played every inning of every game. I didn’t pitch, I didn’t catch, I didn’t play the outfield. Now, if asked “What position do you play?” kids can’t answer. They can only tell you what position they like best. Some things haven’t changed, though my perspective has. When I was a kid the blessed ice cream truck would always show up right after the last out was made! Today, that blasted ice cream truck always shows up right after the last out is made. But even with all the changes, nothing beats an early evening out on the ball field. I’m coaching with another Episcopal priest who lives in Hingham – the Rev. Tom Mulvey. While our club is mired in the middle of the standings, we do lead the league in one thing: Episcopalians. In between the time I realized that a career in professional baseball was not an option and before that whole call thing kicked in, I thought about becoming a baseball writer. What could be better than being paid to watch baseball games and then comment on them? At least that was my thinking at some point during high school. I read a lot of Red Smith back then in the midst of my daily diet of box scores and attaching tin foil to the antenna of my radio so that I could catch snippets of Orioles games being broadcast on WBAL from my bedroom in Queens, New York. Oh, to have grown up in the age of internet radio. I hadn’t thought much about this until I had to write a brief summary following a recent game for the Hingham Little League website. The winning coach is tasked with writing about the game and, as an assistant coach, this never fell to me. Until last week when the head coach couldn’t make the game (his son’s trumpet concert took priority). For the record, the Bodyscapes Fitness club is coached by two Episcopal priests — the Rev. Tom Mulvey, Hingham resident and priest-in-charge at Emmanuel, Braintree, and yours truly. This hasn’t helped our record, mind you, but we do lead the league in Episcopalians. So here’s my game review. It’s not exactly ESPN-worthy but it was a lot of fun to write. 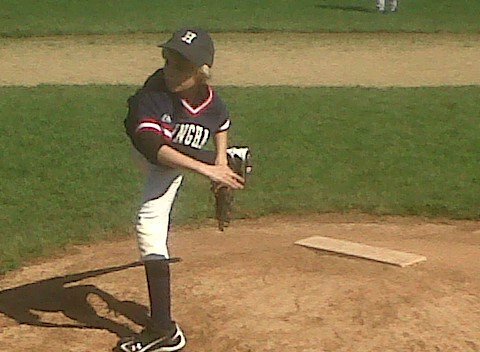 Plus Zack had a great game on the mound. Backed by superlative pitching on both sides, Bodyscapes Fitness rallied to defeat Fruit Center 4-3 in a quick game that may have set a minor league land speed record of just one hour and 20 minutes. The four pitchers (Will Sutton and Zack Schenck for Bodyscapes and the Fruit Center “Joes” – Sylvester and Bandera) combined for 22 strikeouts and a mere 7 walks. Aiden Torres powered the offense for Bodyscapes with two triples and two RBI. Jared Testa scored two runs and Chace Congdon drove in Torres for the winning run in the bottom of the fifth to complete the rally. In a back and forth game, Fruit Center jumped out to an early lead with back to back to back hits in the first inning by Joe Sylvester, Colin Gannon, and Joe Bandera. They added a third run in the third inning as Bandera drove in his second run of the game. In what would ultimately prove to be the game-saving play, Bodyscapes recorded a rare 7-5-2 putout at the plate with Jonathan Fasoli applying the tag to foil a third inning Fruit Center rally. Zack Schenck pitched a perfect three innings in relief, striking out 7 of the 9 batters he faced to close out the victory. The game ended, as it began, with a strikeout. 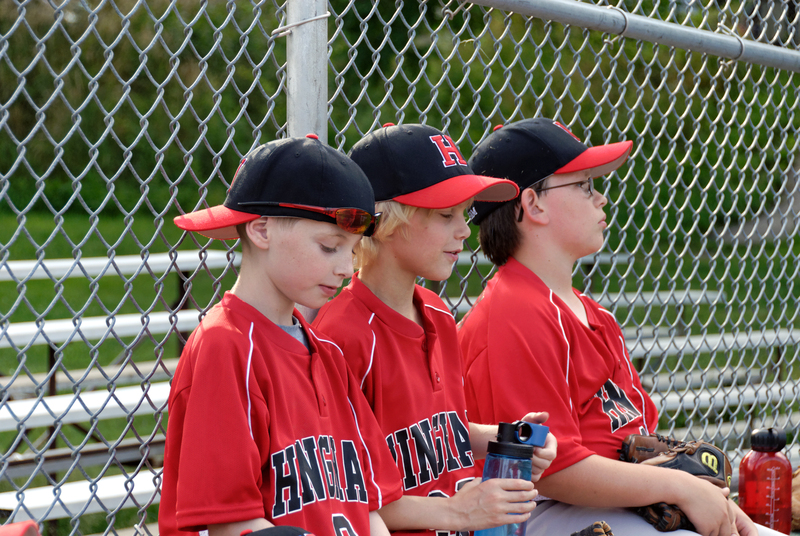 In my latest column for The Hingham Journal I write about the joys and crazy coaches of summer little league baseball. Oh, and my prized possession: a stadium seat from the old Memorial Stadium in Baltimore. With my two sons playing on separate travel baseball teams, I’ve spent a lot of time on little league diamonds this summer. I’m not complaining – nothing beats watching your boys play ball on a beautiful summer evening. Losing makes the ride home from Duxbury or Rockland drag on but they’ve been playing well and having fun. I’ve even picked up my old habit of spitting sunflower seeds which I haven’t done since college. Mind you there hasn’t been a major leaguer to come out of Hingham since Mike “King” Kelly starred for the Boston Beaneaters in the 19th century (I don’t think I’d enjoy sitting in that dugout). Sure, Red Sox pitcher Tim Wakefield lives in town but it’s not as if he learned his famed knuckleball on the mean streets of Hingham. But when you’re nine and eleven-years-old the odds are irrelevant – the dream of playing professional baseball is alive, well, and thriving. You do see some amazing things on the fields of the South Shore. And I’m not just talking about astounding hits and spectacular errors. At one game we encountered a coach who, after witnessing a few bad plays in the field, literally stopped the game and stood on the third base line to berate his team. All of the wonderful noises of youth baseball – the encouraging chatter, the pounding of fists into mitts, the ping of the ball hitting the bat, even the chime of the blasted ice cream truck – went silent. With the bases jammed for the Hingham Americans, all eyes were riveted on this coach. Players, parents, younger siblings, even the several dogs in attendance stopped to stare and listen to the embarrassing diatribe which culminated with his screaming, “You ought to be ashamed of yourselves!” Which, of course, was beautiful irony. There was indeed someone who should have been ashamed. But it certainly wasn’t the poor second baseman who let a ball slip through his legs or the pitcher who became increasingly flustered by a parade of walks punctuated by verbal abuse. As I stood in disbelief at the third base coach’s box, another one of our coaches went over to comfort the second baseman who had burst into tears. 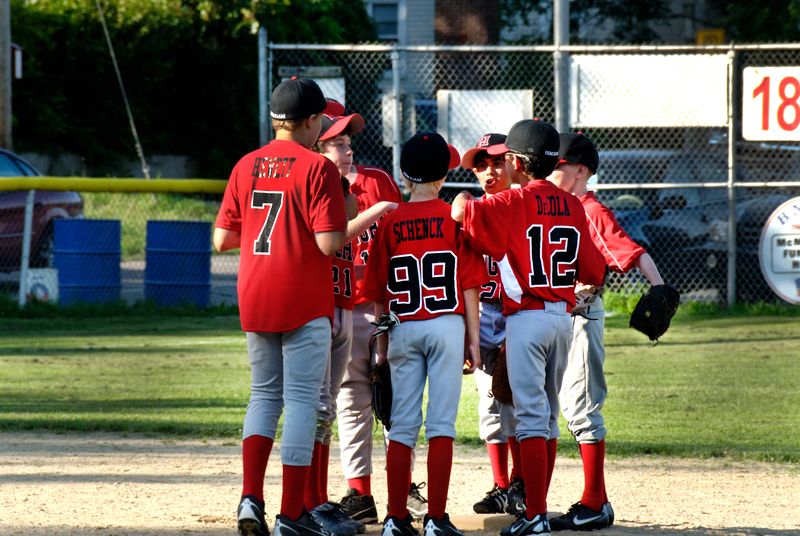 One thing’s for sure – the kids on our team have a new appreciation for their own coaches who are encouraging, positive, and take joy in imparting baseball wisdom. It’s been said that baseball is a form of liturgy. And there is indeed a high degree of ritual involved in the game. It can be understood at multiple levels and, when it is played with preparation, passion, and joy, it is beautiful to behold. Perhaps that’s why I’ve always been drawn to it. It is also relational – beyond the team camaraderie baseball has historically drawn fathers and sons together. For me, the tragedy that night was watching it pull a father and son apart; it was the coach’s son getting shelled on the mound. My own father took me to my first baseball game in 1975, shortly after my family moved to Baltimore. He had absolutely no interest in the game; he was a symphony orchestra conductor after all. I fell in love with the game at first sight and over the years he actually became quite an Orioles fan himself. When he was dying of cancer he wrote me a letter while he watched the last game ever played at the old Memorial Stadium before it was torn down. In it he wrote about his love for me and the sense of peace he felt as he prepared to take leave of this world. He died several months after the final out was recorded and I’ve always associated the death of Memorial Stadium with the death of my father. Its final destruction was like one last shovel-full of dirt being thrown over my earthly relationship with him. I still mourn the loss of the stadium, as I do the loss of my father, but I also take comfort in having known them both. Just before the stadium was razed, they announced the sale of artifacts. I found myself drawn like a pilgrim in search of a holy relic and a seat from Memorial Stadium is now among my most prized possessions. To my wife’s chagrin it sits on our screened-in porch; though she did manage to keep it out of the living room. I’m not entirely sure what drove me to seek out a piece of the stadium. But I do know that it’s comforting to have in the house. If a religious icon is a window into the mystery of the divine, my chair is a kind of icon. It serves as a window into a special time in my life and it somehow puts me in touch with a part of my heart that I will always cherish. One that has been touched over and over again this summer watching my own boys play ball. With both Ben and Zack playing travel baseball this summer I’ve been spending an inordinate amount of time on the little league diamonds of the South Shore. I’m not complaining — there’s nothing better than watching your boys play ball on a beautiful summer evening. I’ve even picked up my old habit of spitting sunflower seeds which I haven’t done since college. You do see some amazing things on little league fields. And I’m not just talking about astounding hits and spectacular errors. No, I’m talking about coaches behaving badly. 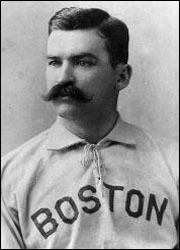 Mind you there hasn’t been a major leaguer to come out of Hingham since Mike “King” Kelly starred for the Boston Beaneaters in the 19th century. Sure, Red Sox pitcher Tim Wakefield lives in Hingham but I’d question whether living in a gated community at Black Rock Country Club even counts. And it’s not as if he learned his famed knuckleball on the mean streets of Main Street. At one recent game we encountered a coach who, after witnessing a few bad plays in the field (ie. little league baseball), literally stopped the game and stood on the third base line to berate his team. All of the wonderful noises of youth baseball – the encouraging chatter, the pounding of fists into mitts, the ping of the ball hitting the bat, even the bell of that blasted ice cream truck — went silent. With the bases jammed for the Hingham Americans, all eyes were riveted on this coach. Players, parents, younger siblings, even the several dogs in attendance stopped to stare and listen to the embarrassing diatribe which culminated with his screaming “You ought to be ashamed of yourselves!” Which, of course, was beautiful irony. There was indeed someone who should have been ashamed. But it certainly wasn’t the poor second baseman who let a ball slip through his legs or the pitcher who became increasingly flustered by a parade of walks punctuated by verbal abuse. As I stood in disbelief from the third base coach’s box, one of our coaches went over to comfort the second baseman who had burst into tears. One thing’s for sure – the kids on our team have a new appreciation for their own coaches who are encouraging, positive, and take joy in imparting baseball wisdom. I’m off to another game tonight and I know there’ll be some excellent plays, some atrocious ones and all sorts in-between. We can only hope that the coaches — as is usually the case — come with the kids’ best interests at heart. After watching Ben cross himself before coming up to bat in a recent little league game I’ve been pondering the parallels between baseball and church. I won’t bore you with a George Will-like treatment of the game but it has been said that baseball is a form of liturgy. I wonder what this would look like if the corollary was true? I like this line of thinking and would only add that hymn boards are the equivalent of the scoreboard on Fenway’s Green Monster; the Altar Guild is the church’s Grounds Crew; the Verger is the mascot (a la the San Diego Chicken); the bishop is the Commissioner — some of them even look like Bud Selig; and sometimes, in the middle of a particularly dry sermon, parishioners wish they could make a call to the priestly bullpen and bring in a relief preacher. But I’ve come to the conclusion that the world needs clergy trading cards. Nothing fancy, just an action photo on the front with parish stats on the back. Even though priests are always saying “it’s not about the numbers” we don’t actually believe this. So we should put our numbers where our mouths are and stick them on the back of bubble gum cards. Some of the info would be pretty basic: height, weight, diocese, wingspan when in the Orans Position. But I’d also like to see statistics such as weddings, baptisms, and funerals performed. As with baseball cards, this should be a year-by-year accounting along with the career totals on the bottom line. One measure of effectiveness would be to offer a wedding percentage. This would be calculated by dividing the total number of weddings performed by the number of marriages that “stuck.” Thus if your wedding percentage was .750 it would mean that 2.5 weddings out of every ten performed ended in divorce. Imagine the fun vestries could have as they pondered trading their under-performing curate for a seminarian to be named later. And imagine the joy of a disgruntled parishioner pinning the rector’s card up to the dart board in the family rec room. They would still be sold in wax packs but rather than a stale piece of gum you’d find a stale wafer. So collect ’em all! 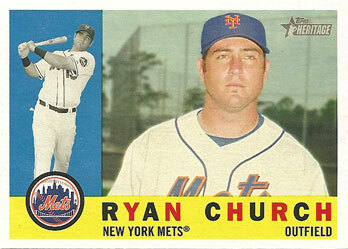 And look for my 2000 rookie card — it might be valuable one day.